Growing up, I never attended a traditional summer camp. You know…the kind where you stay in rustic cabins and partake in outdoor activities, like canoeing and archery. I was the kid who preferred to stay inside, reading a pile of library books or playing Frogger on my Atari. One of my internet friends (a fellow Missouri librarian named Kim, whom I came into contact with thanks to our mutual love of RV Family Travel Atlas) first invited me to attend Glamp Pin Oak at Lake of the Ozarks State Park in 2017, and I was instantly intrigued when I saw that the weekend included gourmet s’mores, Missouri wines, and several fun activities, all at a reasonable cost. I was in! I had so much fun in 2017 that I returned with a pair of friends (Angie and Lisa) in 2018. Lake of the Ozarks State Park is located in central Missouri along the shores of a lovely lake. This region is popular with travelers from Missouri’s two largest cities, due to its central, accessible location. Over the years, it’s become a little notorious for the epic partying that takes place on sunny summery weekends. 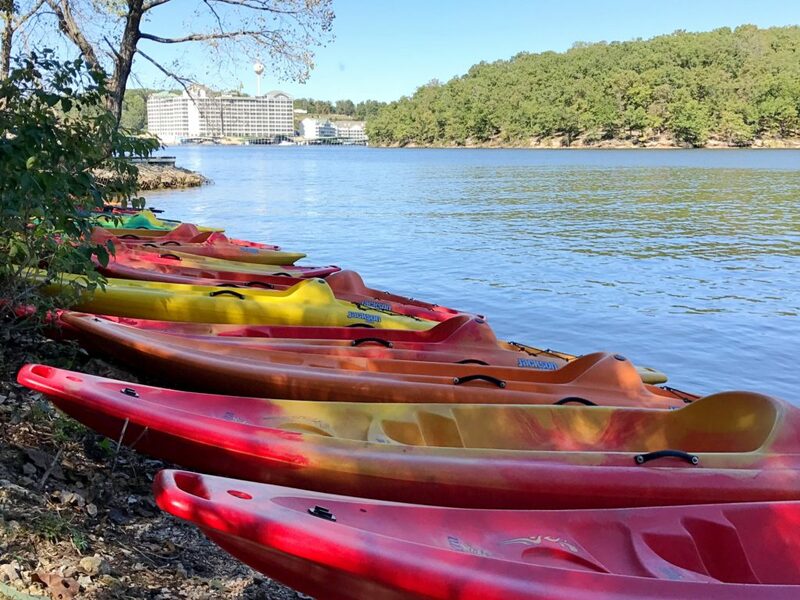 Long before party yachts filled the coves, Lake of the Ozarks was dedicated as a National Parks Service Recreational Demonstration Area (RDA) in the 1930s. The CCC built many structures along the shores, including Camp Pin Oak, which later became a Girl Scout camp. In the decades following 1936, hundreds of girls would camp here each summer. Because of this long history, the Pin Oak area is on the National Register of Historic Places. In 2010, lightning struck the dining hall, burning it to the ground. 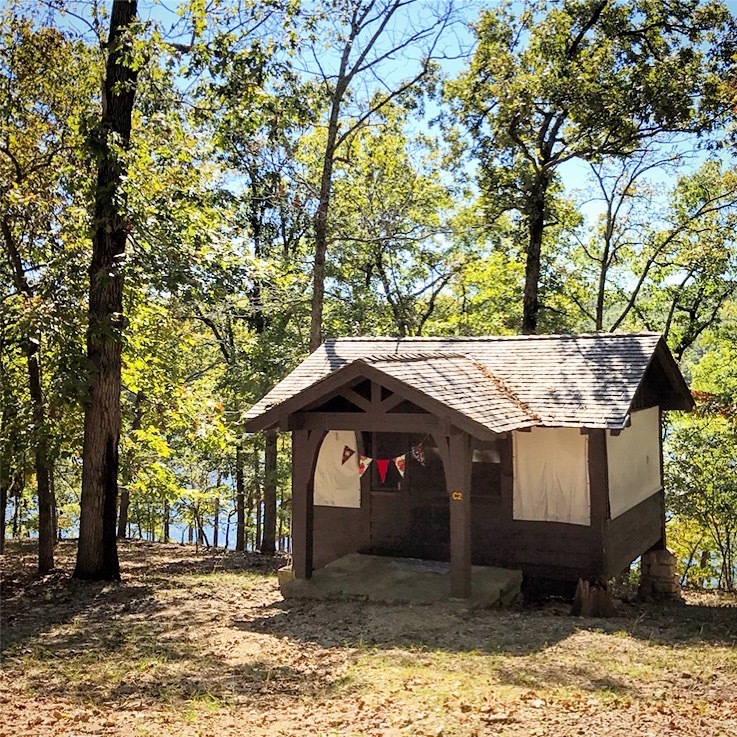 Luckily, a new dining hall was built, which serves as a beautiful meeting place for Glamp Pin Oak and other events held at Lake of the Ozarks State Park. Not long after the new dining hall rose from the ashes, it was time for a new camp to use the historic Pin Oak facilities. 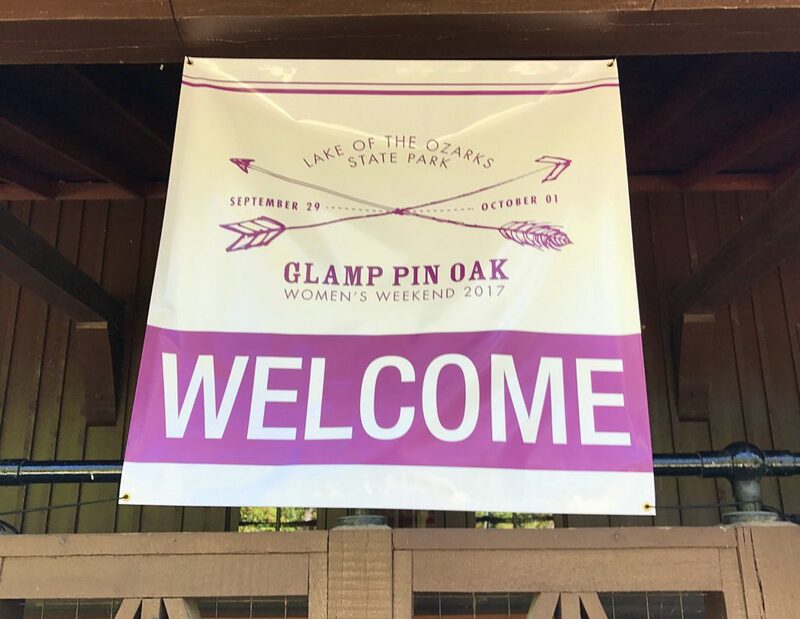 Glamp Pin Oak was born, and women from across the state soon found themselves partaking in some of the same activities our Girl Scout ancestors might have enjoyed under the oaks along the shores of the Lake of the Ozarks. Glamp Pin Oak officially kicks off on a Friday evening, with snacks, crafts, and activities. The next day includes a full breakfast, followed by a rotation of four activities (such as kayaking, archery, a craft, outdoor skills demonstrations, etc.). 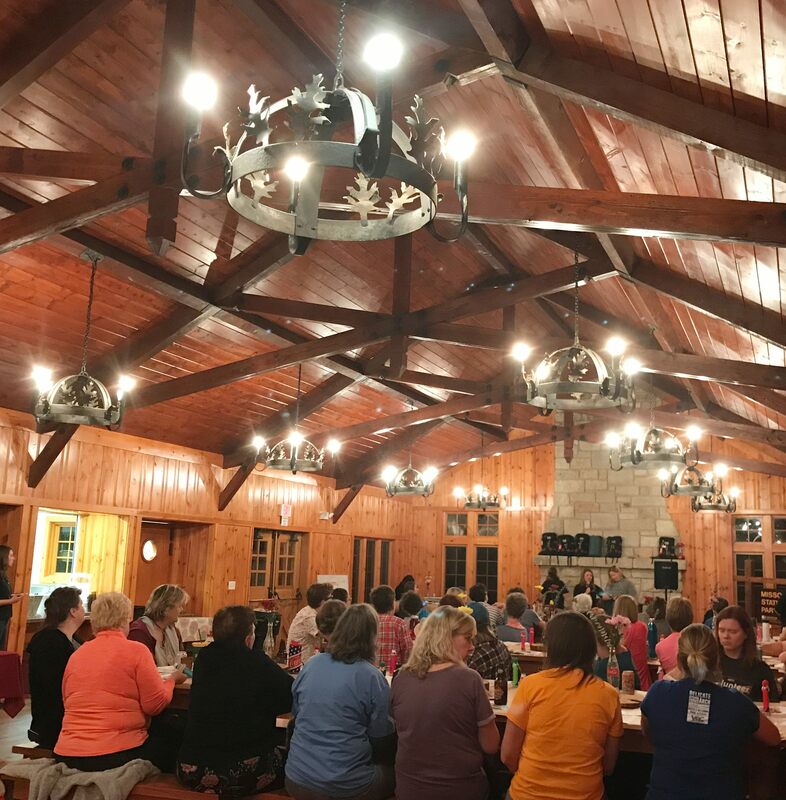 Later, the Missouri Wines Association hosts wine sampling, followed by dinner, and gourmet s’mores around the campfire. On Sunday morning, campers are served coffee and breakfast before they pack up and head home. 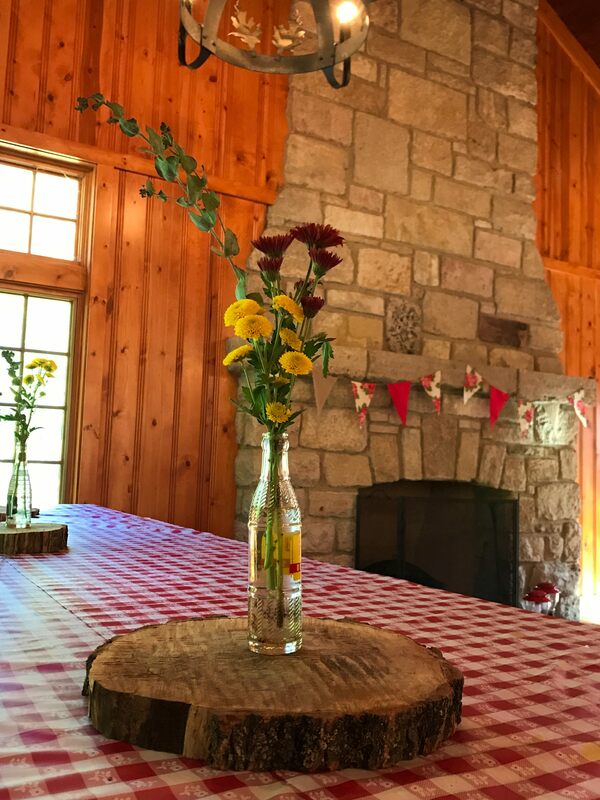 In 2017 and 2018, this full slate of events, food, and lodging only cost $80–a terrific deal in my opinion! I have to admit I approached my first weekend at Glamp Pin Oak with a bit of trepidation. 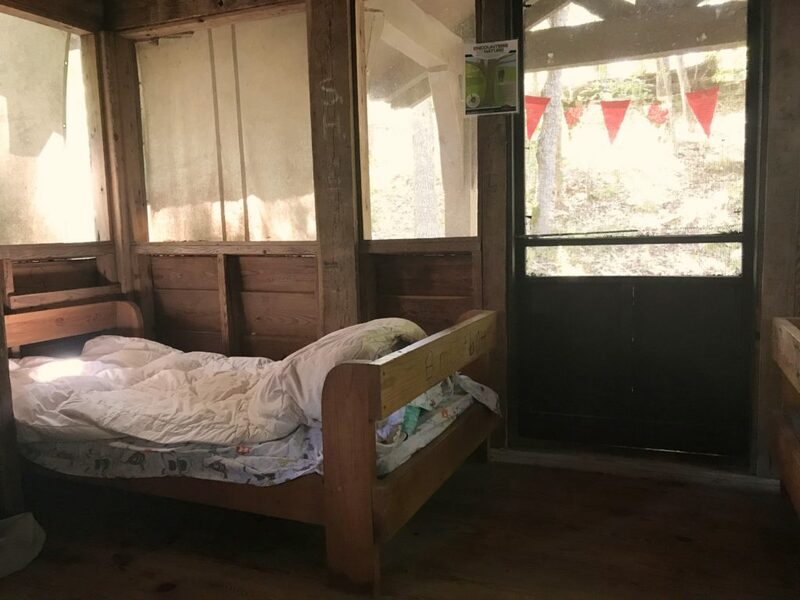 I’m a girl who enjoys her creature comforts, especially interior plumbing, and I had no idea what to expect for sleeping accommodations at camp. Thus, I was a little unprepared for our experience. Campers stay in the rustic cabins onsite, and when I say “rustic,” I mean rustic. These cabins are screened-in, meaning they do not have heating or air conditioning, nor do they have a restroom. Inside, you’ll find 4 wood beds, complete with vintage camp mattresses (the thin plastic kind). Campers must bring their own linens and plan to walk a short distance to the restroom. 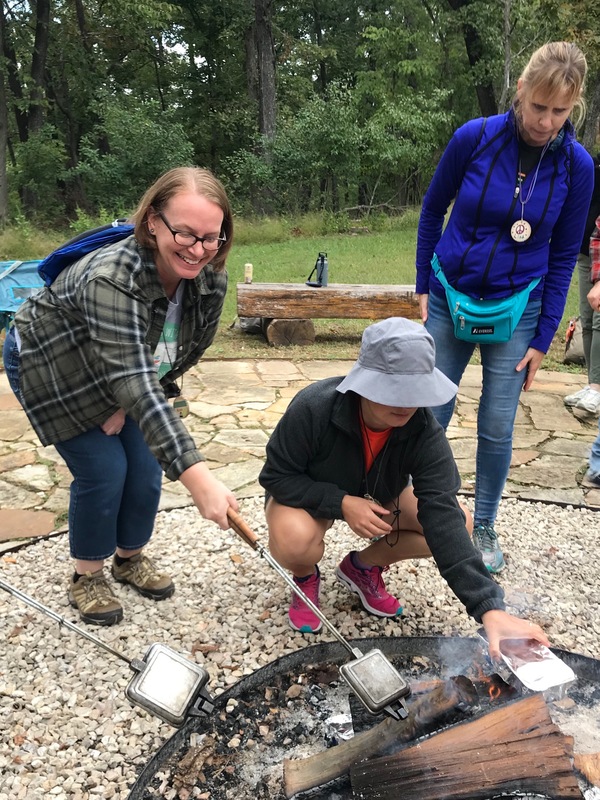 The cabins do have electric outlets to plug in your phone and other items, as needed, but campers are warned not to bring space heaters or other items that might overload the circuitry. As I made my bed for the first time, I couldn’t help but notice the cobwebs in the corners. The fear of spiders became more pronounced when one of my cabin mates squeaked after a close encounter with one. Though spiders aren’t my favorite bedmate, that isn’t what actually kept me awake my first night. What did me in was the cold. Even though I had taken a thick pad for my bed and a down blanket to snuggle under, the air that pushed in through the screened windows seemed to settle upon us like a brick of ice. I tucked myself into a ball and curled up under my blanket, but to no avail. I was ice cold, and there was nothing that could be done about it. The frigid air nipped at my nose. For my second year, I went in much more prepared. This time, I packed flannel sheets for my bed, toasty winter pajamas, and more blankets. Even though the temperatures dipped into the 50s, the cold couldn’t penetrate the thick layers I had wrapped around myself. I was definitely snug and cozy. Despite the fact that I missed my travel trailer, Birdy, and I was unaccustomed to my rustic accommodations, sleeping in the cabin added a whole new layer of adventure to my experience. Plus, aren’t these cabins adorable? I love that Glamp Pin Oak provides a variety of four educational and adventurous activities. Each year, I’ve had the opportunity to try new things. Most importantly, the instructors on hand are helpful and encouraging. Here, I was able to glide across the waters of the Lake of the Ozarks in a kayak, as we slipped into the quiet coves. 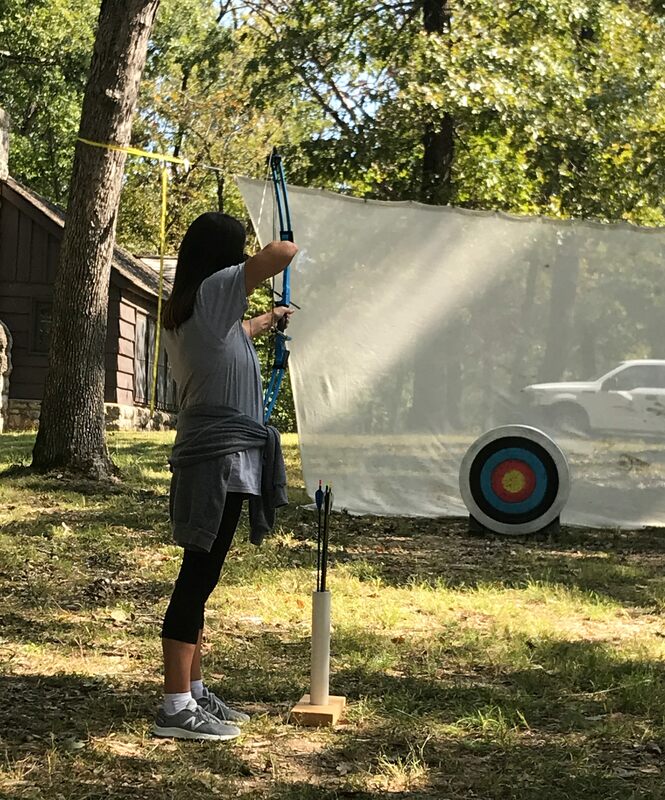 Here, I was able to try my hand at archery under the shade of the tall trees. After smacking my arm with the bow string a couple of times, I decided archery wasn’t quite my thing. My friends were much better at this new sport. 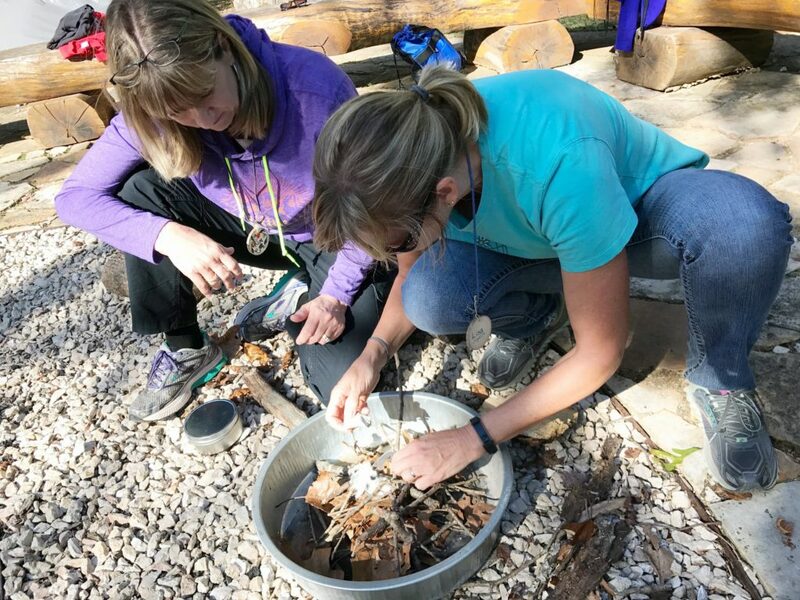 Here, I got to experiment with starting a fire without a flame, another activity I wasn’t very successful at, but I was glad to have the chance to try. 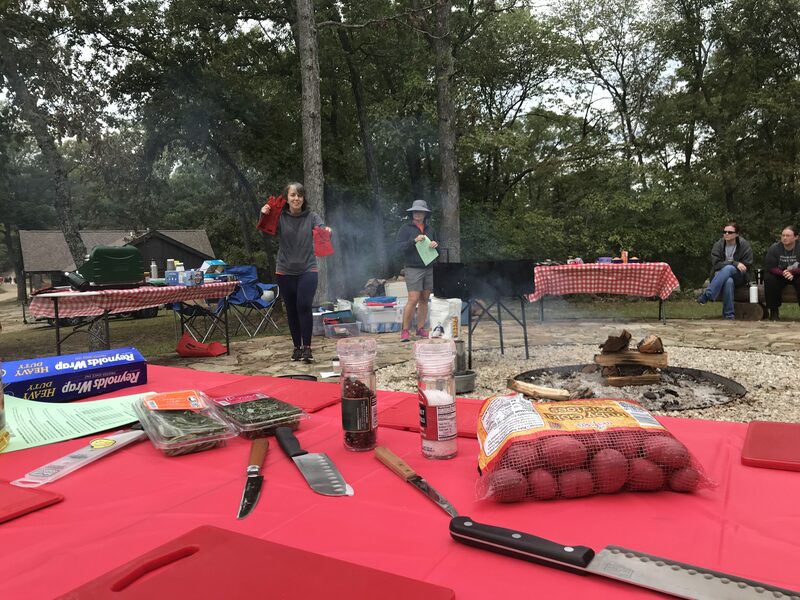 Here, I was able to try new recipes for cooking over the campfire. While archery and fire building didn’t come naturally for me, toasting a brie, berry, and apple sandwich offered sweet redemption. Here, the air was chilly as we prepared chilaquiles and rosemary potatoes on the camp stove, but the peppery Mexican hot cocoa helped warm us up. Here, I got to try my hand at crafting. The dining hall porch buzzed with the sound of multiple blenders chewing paper into pulp as we learned how to make paper this year. These many activities keep campers busy throughout the day, but the fun doesn’t end when the sun goes down. Evening activities have included bingo, a trivia contest, and a movie night. 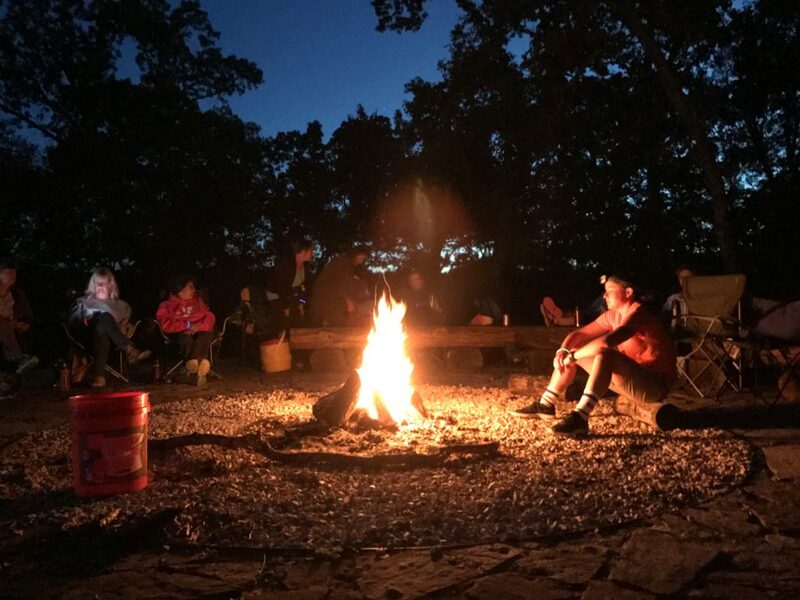 Of course, gathering around the campfire is the perfect way to end a day at Glamp Pin Oak. I enjoyed spending time with friends old…and new. Even though I only knew a handful of people at Glamp Pin Oak, I felt like I had a lot in common with my fellow campers. Why else would we be there? We likely shared a sense of adventure. Glamp Pin Oak fulfills its mission to help women become more safe and comfortable in the outdoors, but more importantly, it provides a space away from everything else for women who may not often make enough time for themselves. Throughout my days, I’ve been wearing many hats lately: doctoral student, teacher, mom, wife, freelance writer, and more. These activities keep me busy both day and night. Glamp Pin Oak gave me the time and space to try on a few new hats: kayaker, crafter, and bingo player. This escape from my everyday world was just what I needed. Isn’t that exactly what camp is supposed to offer? Posted in: Miscellaneous Musings, Places We've Explored. 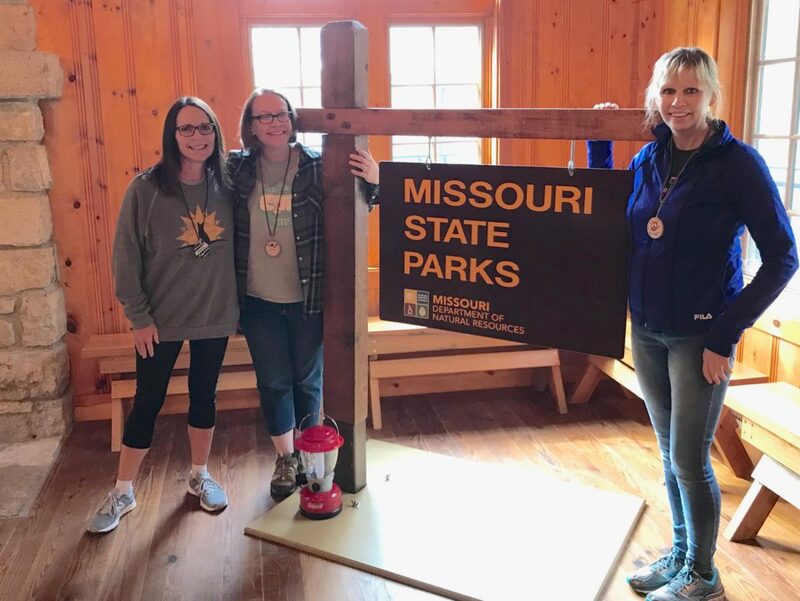 Tags: Missouri, State parks.